One of the world's most familiar spices is an up and coming treatment for diabetes, weight control, and hypoglycemia. That modern medicine would finally be finding applications for cinnamon isnÍt surprising. Cinnamon has been used as a herbal medicine in China for at least 4,000 years. Traditional Chinese Medicine still uses cinnamon as a "warming" agent to fight infections occurring when there is cold or fatigue and to increase the activity of the digestive tract. Chinese cinnamon was the first cinnamon species that made its way to Europe since Alexander the Great. Before this time, cassia was transported as far as Egypt and Israel. This ingredient is cultivated for the bark, buds, and oil of cassia in the southeastern provinces of China. Recent studies have tested this herb for its positive effect on the digestive system. It has also been praised for its promotion of settled tissues and membranes in various tracts from the stomach to the colon. Chinese cinnamon has also been studied for its positive support of the immune system. Small amounts, that is, between 0.5-4% essential oil containing 60-9=80% cinnamaldehyde, up to 12% eugenol and 4-10% trans-cinnamic acid; 4-10% phenolic compounds; tannins; catechins; oligomeric proanthocyanidins; other monoterpenes including limonene and alpha-terpineol; sesquiterpenes including pinene; calcium monoterpenoid oxalates; gum; mucilages; resins; starch; complex sugars in amounts to small to affect blood sugars; and traces of coumarin. The German Commission E recommended cinnamon for treating loss of appetite and stomach upset, and cinnamon powder teas have been used for centuries to prevent bloating and flatulence and to treat heartburn and nausea. Cinnamon powder's beneficial effects on the digestive tract are attributed to its antioxidant catechins, chemical compounds that are also found in tea.Cinnamon powder has antioxidants may also fight bacterial, fungal, and parasitic infections, especially yeast infections of the mouth (oral candidiasis) in people with compromised immune systems. 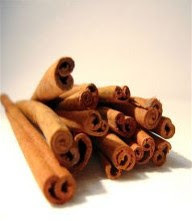 There are some scientific indications that cinnamon relieves the pain of ulcers, and the herb is also very useful in regulating the activity of insuli, so effective, in fact, that diabetics may need to check their sugars more often if they eat large quantities (more than 1 tablespoon) of cinnamon powder every day. It does not stimulate the release of insulin, but it helps insulin work more effectively. A recent study by a team of surgeons, for example, found that a solution made with cinnamon oil killed a number of common and hospital-acquired infections, like streptococcus and methicillin-resistant Staphylococcus aureus, or MRSA. The study found it was just as effective as several antiseptics widely used in hospitals. Another study by French researchers in 2008 had similar results, showing that at concentrations of 10 percent or less, cinnamon oil was effective against Staphylococcus, E. coli and several antibiotic-resistant strains of bacteria.